Nowadays, many smartphones allow users to shoot a whole 4K video such as Samsung Note 3, Galaxy S5, Sony Xperia Z2 and newly-released iPhone 6s, iPhone 6s Plus all have supported 4K video recording. But few phones have an ability in playing 4K resolution video. Absolutely, iPhone 6 (Plus) also can not hold or play 4K videos. To enjoy 4k resolution video on iPhone 6 (Plus), you need a 4K video converter to convert 4k UHD videos to iPhone 6 (Plus). Fortunately, iPhone 6 (Plus) 4K Video Converter is such a professional tool. How to convert 4K video to iPhone 6 (Plus) video format ? Step 1. Run this iPhone 6/Plus 4k Video Converter and click “Add Videos” or “Add or Drag Files” load the 4k video file. Step 2. Choose an output profile. You can go to Output Profile > Apple Device> select "iPhone 6 MPEG-4 MOVIE (*.mp4)" or "iPhone 6 Plus MPEG-4 MOVIE (*.mp4). But customized MP4 Movie (*.mp4) is highly-recommended. 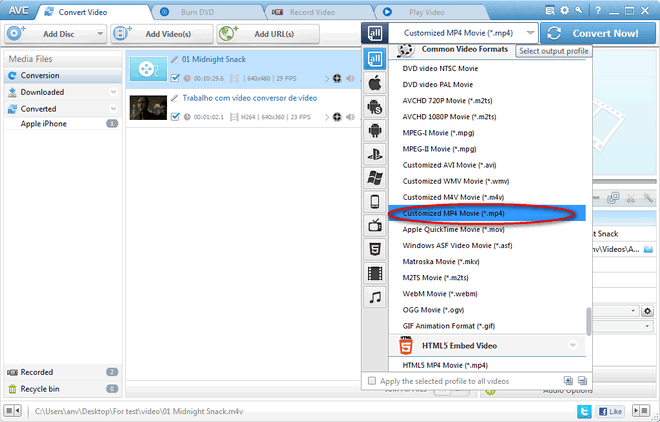 You can customize video and audio options, such as Video Codec, Video Bitrate, Video Size, etc. Step 3. Click “Convert Now” button to start converting 4k videos to iPhone 6 or Plus video format. Once the conversion is completed, you can click "Output Folder" button to get the converted 4k videos. To play those converted 4K videos to iPhone 6 (Plus), iPhone Transfer tool is a must to copy the 4K videos to your iPhone 6 or Plus. How to transfer converted 4k video to iPhone 6 (Plus) ? Syncios iPhone 6 (Plus) transfer can move the converted 4K video from your computer to iPhone 6 or Plus fast and easily. Besides, it can also support downloading 4K videos to iPhone 6 (Plus) directly. Simply download this free iPhone data transfer tool to your computer and transfer 4K video to iPhone 6/Plus. Plug you iPhone 6 (Plus) into the computer, and then run this iPhone Transfer tool. Press Media tab on the left panel of the program, click Import button. 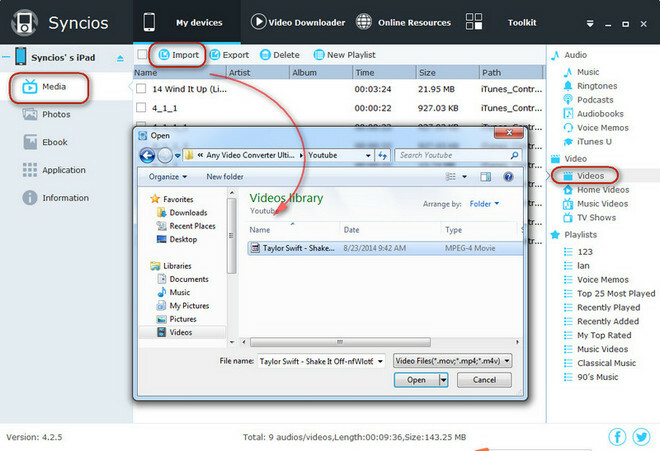 Choose converted video files in your computer and import to your iPhone 6 (Plus). Now, you've got the 4K videos to your iPhone, just enjoy them.